Hello beauties! Our baby The Brown Muses has turned 1 and we could not be happier. This blog was started to share our mutual love for non-toxic beauty products, makeup, fashion and lifestyle. During our journey, we have been encouraged and appreciated by our readers and fellow bloggers. 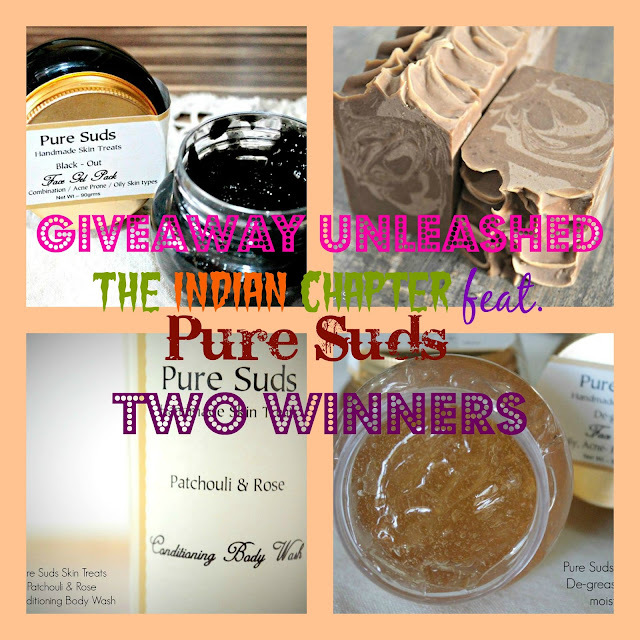 As a token of gratitude, we are organising a giveaway with Pure Suds, a brand based in Rajasthan that handcrafts bath and body goodies! It's our way of saying thank you to everyone who has been a constant support. There will be TWO WINNERS, and prizes worth INR 1500 are up for grabs!! LIKE US AND PURE SUDS ON FACEBOOK. FOLLOW US AND PURE SUDS ON INSTAGRAM. REPOST ON INSTAGRAM & TAG FIVE FOLLOWERS WITH HASHTAG #TBMANNIVERSARYGIVEAWAY. ALL THE STEPS ARE MANDATORY. IT IS OPEN TO RESIDENTS OF INDIA ONLY. THE GIVEAWAY IS OPEN FROM 4TH JUNE, 2016 - 19TH JUNE, 2016. TWO WINNERS WILL BE ANNOUNCED ON 21ST JUNE, 2016. WINNERS WILL BE CHOSEN THROUGH Random.org. IF A WINNER DOES NOT CONTACT US WITHIN 48 HOURS OF THE ANNOUNCEMENT, ANOTHER WINNER WILL BE CHOSEN.